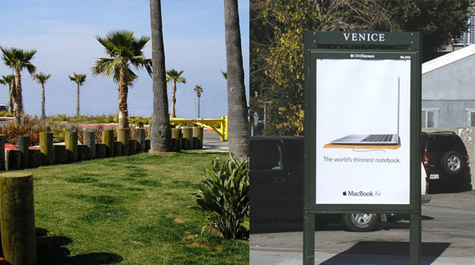 The site, above left, on the ocean side of the Venice Boardwalk, could get advertising “kiosks” like the one at right if the city succeeds in exempting street furniture from guidelines set forth by the California Coastal Commission, which prohibit billboards and other forms of off-site advertising in the coastal zone. The so-called ‘public amenity kiosks” are among items of “street furniture” being erected around the city by CBS/Decaux under a 2001 contract that provides revenue to the city. Because these structures are placed in the public right-of-way, the city doesn’t require the company to obtain sign permits or submit to any public hearing process. 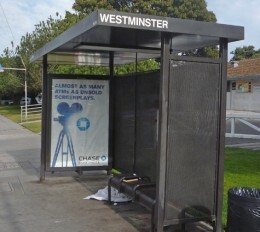 However, when the kiosks and bus shelters began appearing last year in the Venice coastal zone west of Lincoln Blvd., some members of the Venice Neighborhood Council cried foul and solicited an opinion from the California Coastal Commission staff that the bus shelters and mini-billboards did indeed require what is called a Coastal Development permit. Those permits are issued by the city, but approvals are required to conform to Coastal Commission regulations and the public has the right to appeal such permits to the Commission. The Coastal Act states: The scenic and visual qualities of coastal areas shall be considered and protected as a resource of public importance. Further, the Coastal Commission’s “Interpretive Guidelines” state that signs should only be on-site, not off-site, and that signs should not interfere with or disrupt any views. Despite this, the city’s Board of Public Works earlier this week adopted findings that street furniture doesn’t detract from any coastal resources and that it should be exempt from coastal permits and requirements limiting signage. Failure to implement this exemption could cost the city $50-60 million over the remaining 11 years of the street furniture contract, according to the findings. The exemption must be approved by the City Council, and then be submitted as a request to the Coastal Commission. Thus far, CBS/Decaux has submitted requests to place three of the advertising kiosks along the Venice Boardwalk, plus a “vending kiosk” at the Windward Circle area of Venice Beach. A number of bus shelters and kiosks have already been put up by CBS/Decaux in the Venice Coastal Zone, but none west of Pacific Ave.